Nitrome Games has announced that it is partnering with Limited Run Games to bring physical copies of Bomb Chicken to PS4 players. Pre-orders are only available until Friday April 12th, 2019, with orders closing between 6 pm and 11:59 pm EST, so grab a copy while they last. Physical copies of the game are available for $29.99 USD. The physical release includes a cover with interior art and a full-color booklet. For those who are unfamiliar with Bomb Chicken, it is a retro inspired, 2D puzzle-platformer. You play as a chicken who is the unfortunate victim of a “freak accident” which grants it the ability to lay bombs instead of eggs. The chicken gained its abilities after coming into contact with a mysterious blue sauce, developed by the game’s enemy, BFC, which is a large fast-food chain. You can stack multiple bombs underneath yourself to gain height, or use them individually to explode your way through the level. You can also push the bombs towards your enemies at high speed, should you require such a thing, and you can even land on an enemy’s head, much like in Mario, to take out enemies if you don’t feel like being a well-behaved chicken that lays bombs for eggs. 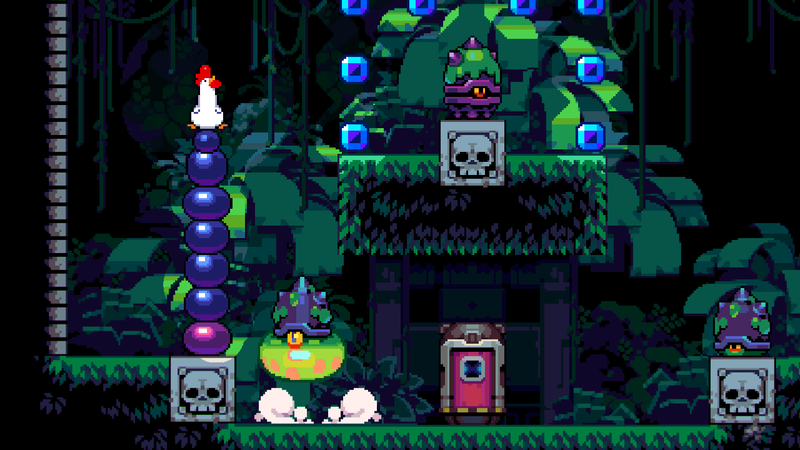 Since Bomb Chicken isn’t just a platformer, there are various puzzles to solve throughout the game’s 29 levels, which are scattered throughout three different worlds. You’ll need to use your bombs, and your wits to progress through each level, solving puzzles as you go. Some of the game’s obstacles include: Floor traps which fall down when the players steps on them, flying arrow traps, blocks which can be blown up and more. The chicken dies in one hit, and you have a set number of lives which can be replenished upon completion of the level. Are you going to be ordering a physical copy of Bomb Chicken? Let us know in the comments below!